AromaBright 5 pk toothpaste allows you to travel with this wonderful toothpaste! Essential oil favorites such as Peppermint, Spearmint, and Cinnamon Bark also give this toothpaste a sweet mint flavor, meaning you don’t sacrifice anything with AromaBright. AromaBright 5pk lets you harness all the cleaning power with more! Pop in a purse, backpack, or carry-on when traveling or keep handy as a perfect introductory product to share with friends, family, or acquaintances. Enjoy all the cleaning power of AromaBright 5pk Toothpaste in a smaller (2 ounce) tube, bundled as a 5-pack. Pop in a purse, backpack, or carry-on when traveling or keep handy as a perfect introductory product to share with friends, family, or acquaintances. 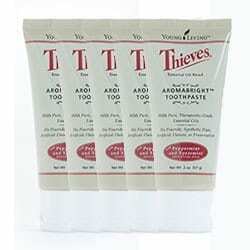 Maintain healthy-looking teeth and gums with Young Living’s AromaBright Toothpaste. AromaBright toothpaste is a great option if you’re looking to combine the benefits of Dentarome Plus and Dentarome Ultra toothpastes. Using essential oils, AromaBright helps you clean your whole mouth for a bright smile. The gentle ingredients also give this toothpaste a smooth texture for a comfortable clean. You’ll keep your smile sparkling without any harsh ingredients.